You can always count on distillers for a lyrical turn of phrase. In their parlance, the vintage whiskey lost in the barrel to evaporation is called the “Angels’ share.” It is hard to anticipate how much those angels will partake. This opens the door for an unlikely scheme in Ken Loach’s working class comedy The Angels’ Share (trailer here), which opens this Friday in New York. Robbie has a temper and a pregnant girl friend. The former almost gets him sent to prison, but the latter helps keep him out. Sentenced to community service, Robbie falls under the supervision of Harry, an understanding middle-aged volunteer. 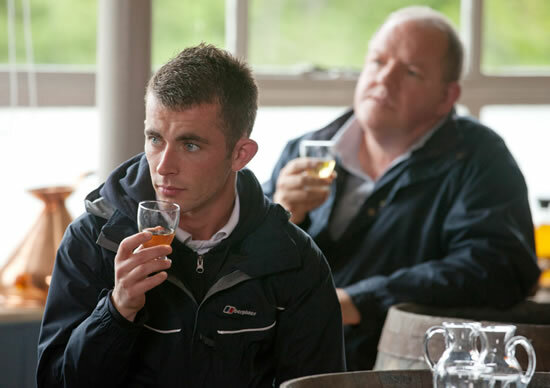 Through Harry’s friendship, Robbie discovers he has a nose, if not necessarily a taste for fine malt whiskey. He also learns of an upcoming auction of one of the rarest vintages ever distilled in Scotland. With the dubious assistance of three losers from his community service, Robbie intends to nick a bit of the angels’ share. The widely accessible Share follows in the tradition of Loach’s Looking for Eric. It is a crowd-pleasing comedy, but it remains faithful to filmmaker’s proletarian aesthetic. Indeed, Loach takes his time, establishing his characters and their lack of prospects before launching into the caper. Yet, it is nowhere near as didactic as his socialist social issues dramas, which is a major reason why Share is so much more entertaining. While looking the part of a troubled young man, Paul Brannigan has genuine screen presence as Robbie. The audience can sense there is a real fire within him, in both good and bad ways. John Henshaw is also quite appealingly down-to-earth and humane as Harry. Veteran character actor Roger Allam (recognizable from Endeavour, The Thick of It, and Parade’s End) adds a welcome splash of roguish sophistication as the mysterious whiskey broker, Thaddeus. Unfortunately, Robbie’s three co-conspirators largely come across like recycled stock characters from previous Loach films, but even at their most exaggerated, they cannot undermine the film’s charm. The stakes are considerable and the milieu is rather grim throughout Share. Yet, it is an enormously satisfying, perfectly titled film. A “feel good movie” does not adequately describe it. “Feel giddy” comes closer. Naturalistic yet uplifting and consistently funny, The Angels’ Share is enthusiastically recommended for general audiences even more than Loach’s usual admirers when it opens this Friday (4/12) in New York at the Lincoln Plaza Cinema.